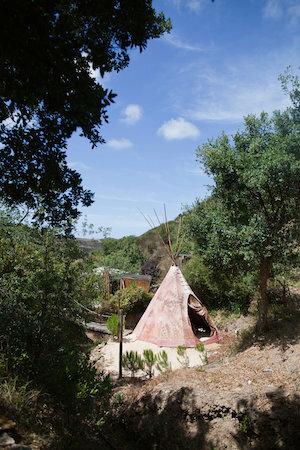 Small Tipi — Tipi Valley is an ecological surf and yoga retreat in the western Algarve, Portugal. A wooden bridge leads you across the brook to a sandy, shady spot where this small one-person tipi awaits you, surrounded by Portuguese cork oak trees. It’s all very quiet and restful. Your own space in time. Our 5 day program runs from Monday afternoon to Saturday afternoon and our 7 day program runs from Monday afternoon to Monday morning. Inquire into our peak and off season prices for available options. Tipi Valley is an ecological surf and yoga retreat in the western Algarve, Portugal. This retreat offers all-inclusive wellness holidays with daily surfing lessons, yoga classes, healthy & hearty mostly organic meals and tented accommodation at the Atlantic coast. The ideal place to enjoy outdoor living!